This generous cleansing foam that comes in 160 ml, is formulated to function in 2 ways: it removes your sunscreen and makeup residues; and exfoliates dead skin cells and impurities deeply embedded in your pores. 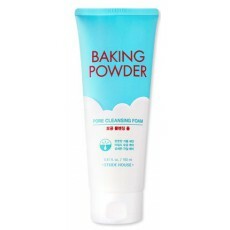 This product contains natural baking soda that gently extract dirt, blackheads and facial oils without irritating your skin. It leaves skin soft, clean and brighter after use. Serves all skin types. Please read reviews for guidance. TIP: You'll notice that your skin is less dry after cleansing, when an oil-based cleanser is used before hand. This is one benefit you get in Korea's double cleansing concept, which is cleansing your skin twice using the precleanser (oil based makeup remover) and afterwards, the use of a water-based cleanser to further slough off dirt residues. Apply ample amount of the cleanser to wet face. Gently massage solution to skin paying particular attention to affected areas like your forehead, chin or around nose. Wash thoroughly with water and pat dry. Follow up with your favorite Korean Hydrating Toner to bring back lost pH and moisture in the skin.